posted on Mar. 1, 2013, at 1:50 p.m. Prepare yourself for greatness. 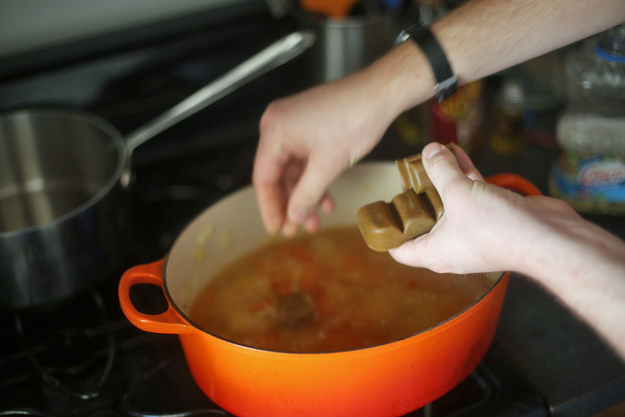 The secret is store-bought curry roux. Last week here in our warm cozy Stew Corner, we took things in an exceedingly healthy direction with white bean and kale. Now that you’re floating on a high of superfoods, I’m going to trick you into entering the equally rich and exciting world ofindustrially processed foods! GASP! Before you reflexively run toward the farmers’ market, take a deep breath. Your Winter Stew Correspondent is going to take you to a special place — where hyper-capitalism has merged with a deep cultural respect for deliciousness. That place is — you guessed it — Japan. And the stew is Japanese curry rice, one of the easiest, cheapest, most crowd-pleasing one-pot dishes you can have in your arsenal. 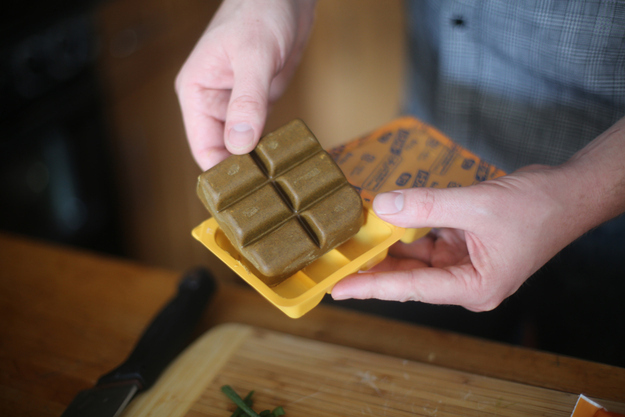 These are Japanese instant curry blocks, also known as curry roux. They cost around 3 bucks, and can be found in just about any Japanese/Korean/Chinese market (orordered online). They may not look pretty, but these dense factory-made cakes will turn any pot of food into a rich, succulent curried stew in minutes. To what do we owe this miracle? Aside from plenty of MSG (which isn’t as bad for you as you may have heard), we have 19th-century imperialism to thank! Japanese curry finds its roots in Indian curry: colonialist English merchants in the mid-1800s loved it so much that they transported its flavors from India to Japan. 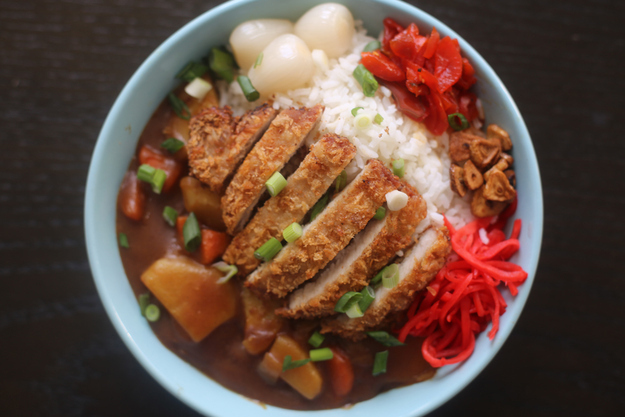 Japanese curry quickly became a sensation, and a thing all its own. Its popularity exploded in the 1960s thanks to the invention of instant curry blocks, and now curry rice is one of Japan’s most popular meals. Toppings at CoCo Ichibanya include everything from cuttlefish to hamburgers to cheese, and secondary condiment choices range from garlic chips to canned tuna. You can also select exactly how much rice you want (in 100g increments) and you can choose from 10 levels of spiciness. It’s insane. Now for the recipe. 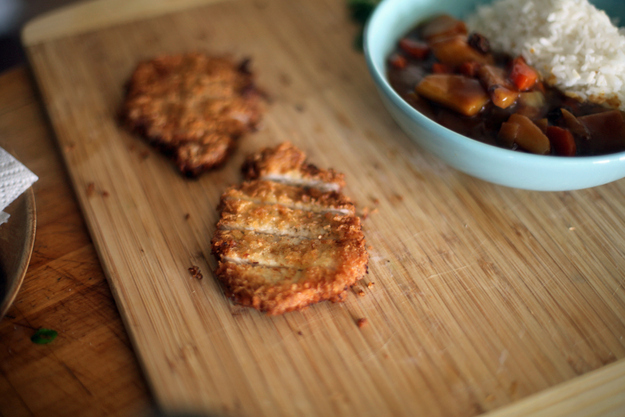 When you make it, you don’t have to tell anyone that this is basically the recipe on the back of the curry roux box. 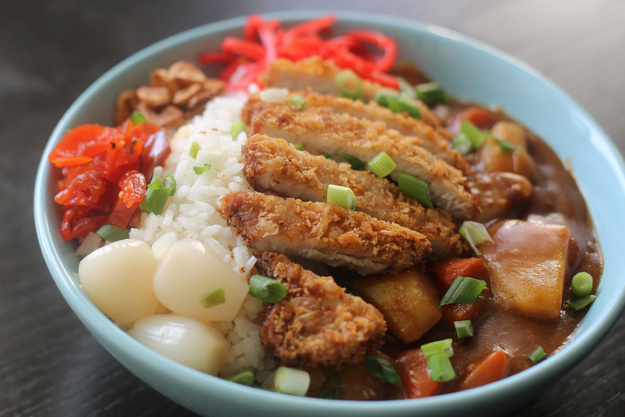 I added my favorite topping — fried pork cutlets — and included some tasty traditional Japanese condiments such as pickled ginger and sour pickled scallions, which you should also be able to find at a good Asian grocery, or online. 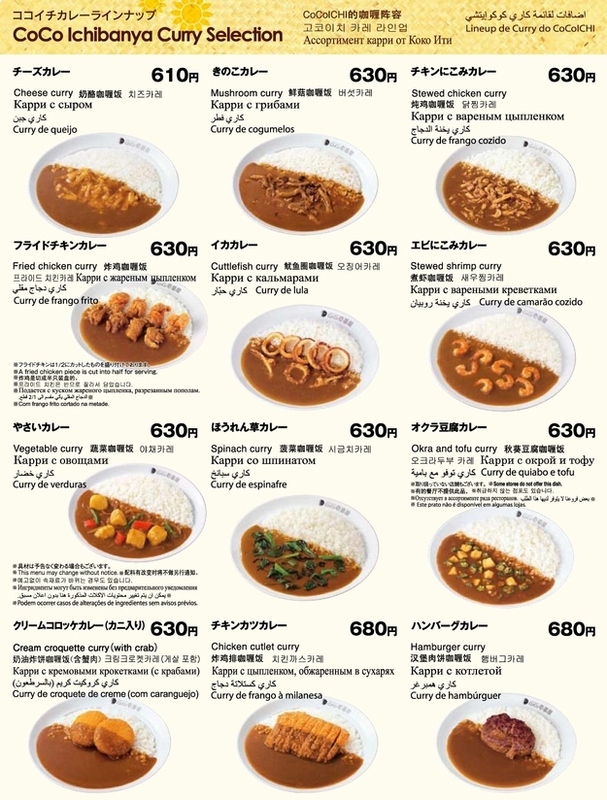 1 240g package Japanese curry roux (The variations here are endless. 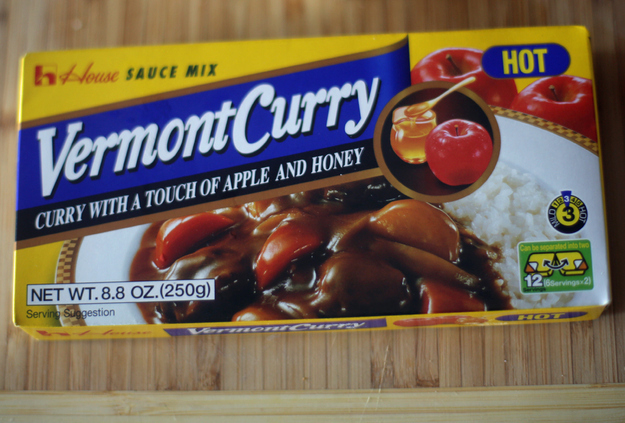 I love House-brand “Vermont Curry” not only for the amazing name, but for its promised essence of apples and honey. You can get most varieties in mild, medium, or hot. They’re all pretty tame — I’d say even if you only like mild spice, “hot” is the way to go). 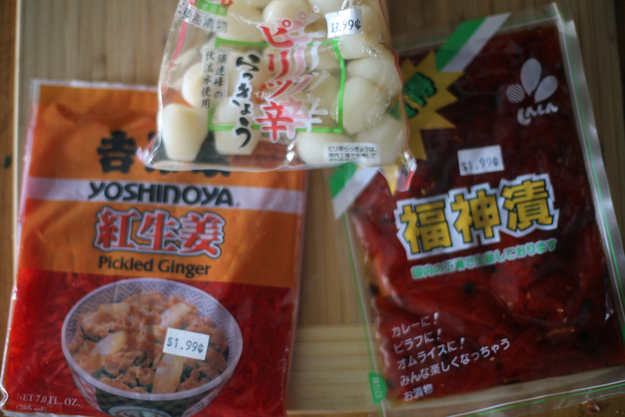 These first two may be hard to find outside of good Japanese groceries, but all are easily available online. Order them! They ‘re cheap, keep forever, and have plenty of other uses. Rakkyo (sour pickled scallions, delicious. Available online here). 1. 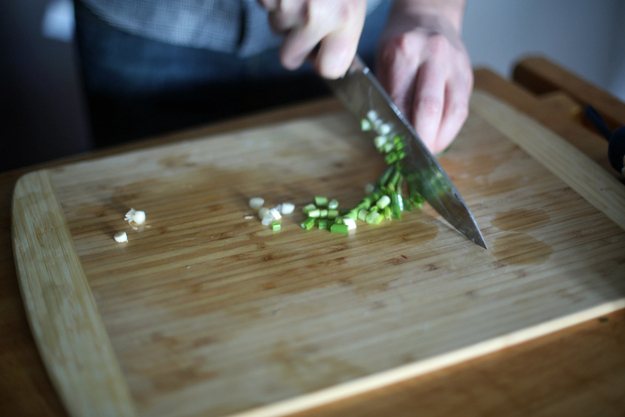 Measure out and prep/chop all of your ingredients so they are ready to go. 2. 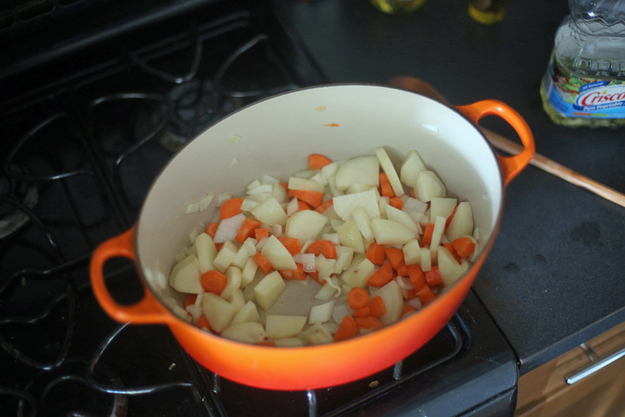 Heat the oil in a heavy-bottomed pan or dutch oven, then sautee the potato, onion and carrot until softened and lightly browned. 3. 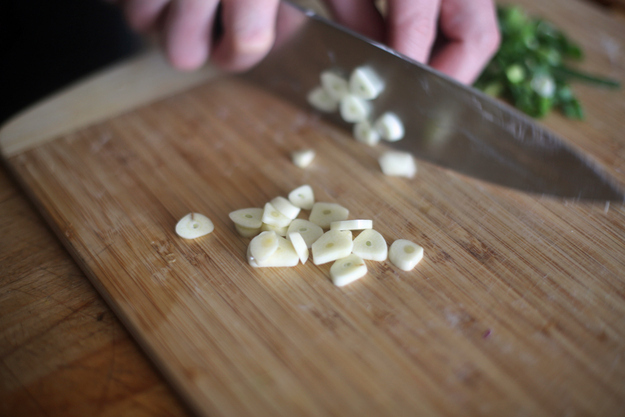 Add the water and raisins, then break up the curry blocks and drop them in. 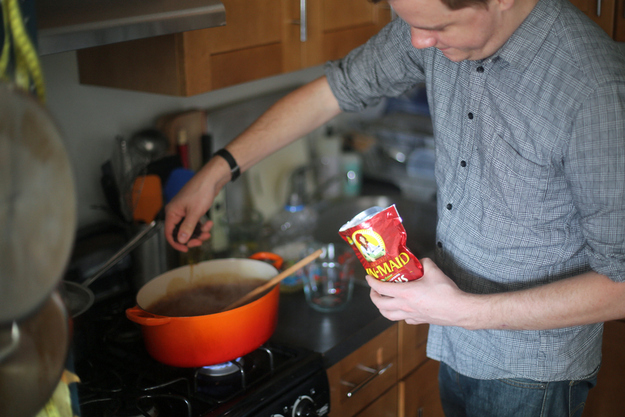 Stir, and watch the magical transformation. 4. 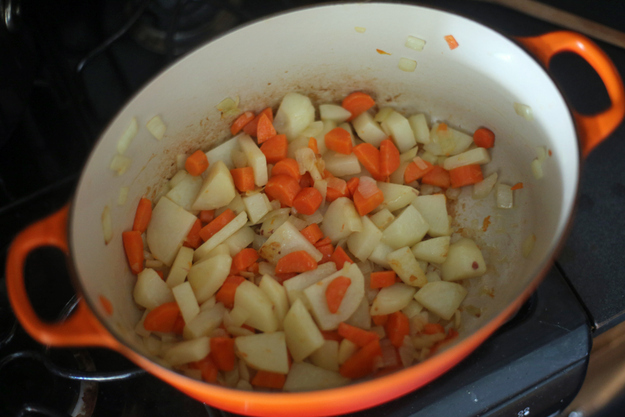 Simmer over low heat until the vegetables have softened to your liking, probably 10-15 minutes. You could very easily eat now (I know! SO EASY), or you keep this pot simmering at low heat for as long as you want as you prepare your toppings and condiments, stirring occassionally to keep the bottom from burning. 1. 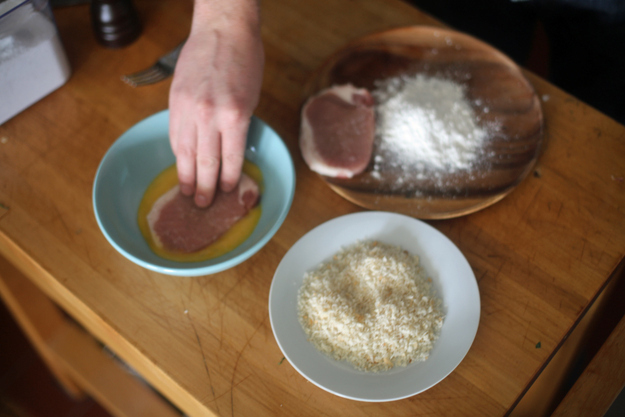 Generously sprinkle each each chop or slice of loin with kosher salt and pepper. 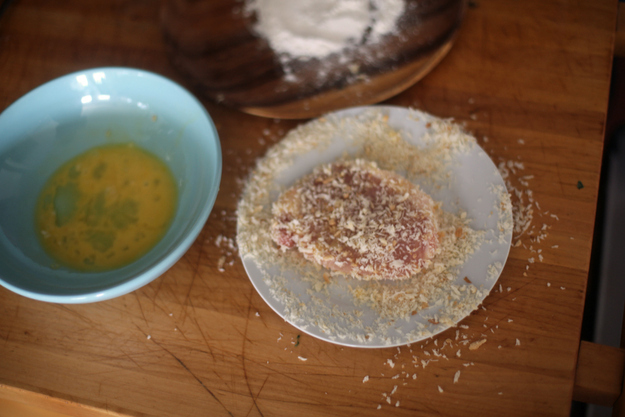 Coat each one with flour, then dip into beaten egg, then coat with panko bread crumbs, in that order. You want it to be nicely coated in crumbs. 2. 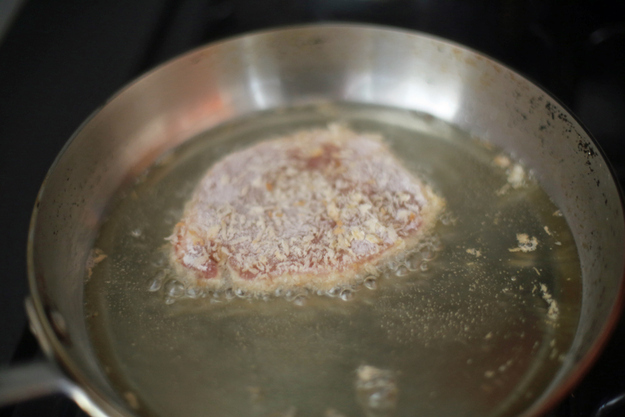 Pour enough oil into a cast iron skillet or small frying pan to make a 1/2-inch pan fry, or about half the thickness of the pork. 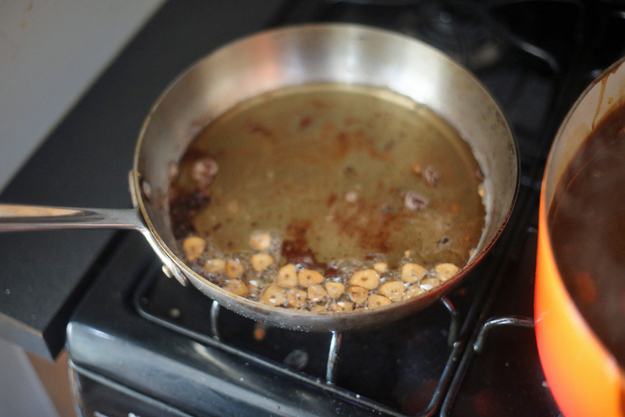 Heat it to around 350° F, or when a test-drop of the egg-flour-crumb mixture sizzles gently in the oil. 3. 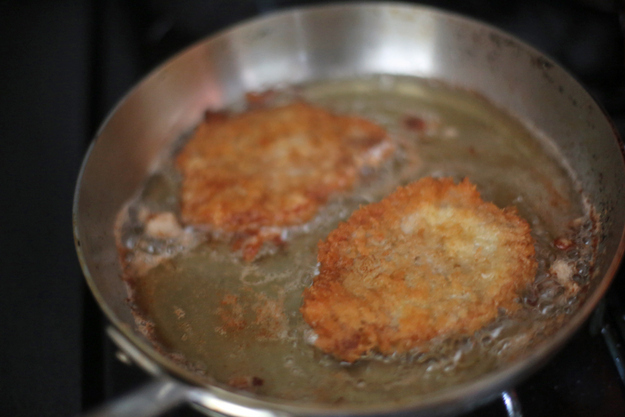 Fry the pork cutlets, in batches if necessary, for about 2-3 minutes a side, until golden brown. 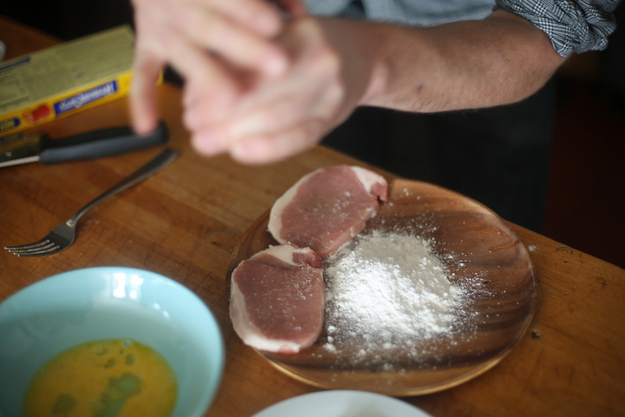 If you’re good with chopsticks, they’re great for delicately flipping your cutlets. When done, place the cutlets on paper towels. 4. 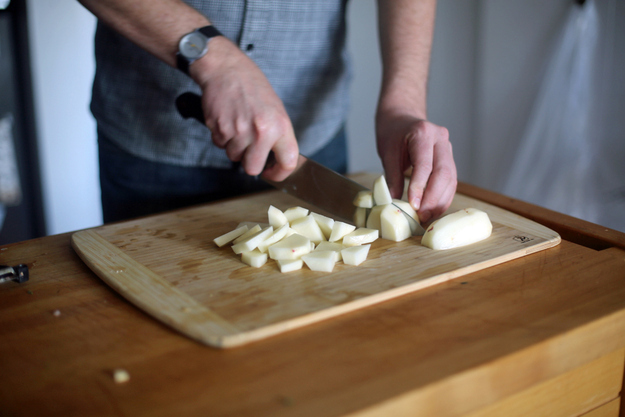 Turn off the heat, but while the oil is still hot, fry you garlic slices until golden brown (1-2 minutes). Be careful — they burn quickly. 1. 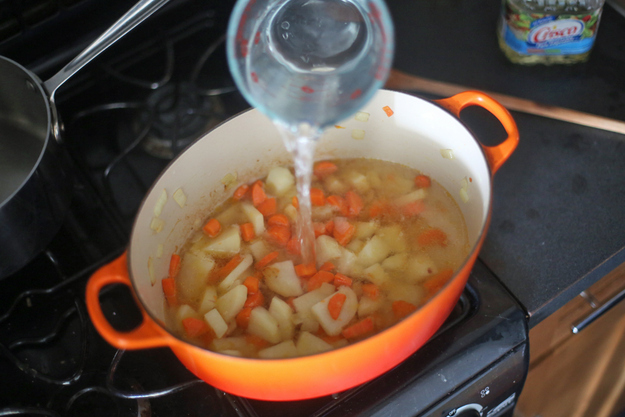 Put a scoop of cooked rice into one half of a bowl or plate; ladle curry into the other half. 2. Around the edge of the bowl, place nice spoonfulls of rakkyo, fukujinzuke, benishoga and fried garlic. Or whatever condiments you want to try!